Azerbaijan and adjacent areas experienced more than 1,050 tremors since early 2017, said Gurban Yetirmishli. 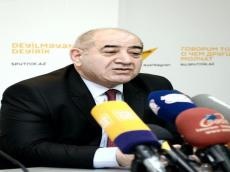 The head of the Republican Seismological Service Center informed that over 9,000 earthquakes were recorded in Azerbaijan and adjacent areas during a year. Recalling that Azerbaijan locates in seismically active zone, Yetirmishli said that the quakes observed in 2016 were weaker compared to 2015. The scientist further stressed that the most modern seismological equipment is installed in Azerbaijan, while no danger and powerful earthquakes are expected yet in the country. Yetirmishli also spoke about the genetic link between mud volcanoes and earthquakes, stressing that eruption of volcanoes does not happen without a reason. “In 2014, two days after the eruption of “Shikhzarli” volcano in Gobustan an earthquake was reported near the volcano. The main influential factor in occurrence of volcanic is earthquakes,” he explained. Speaking about the recent eruption of the Otman Bozdag volcano, one of the world's largest mud volcanoes, he said that prior to the eruption of the volcano some 7-8 tremors were reported near it. Yetirmishli added that the depth of the volcano was 3 km and it was erupted 2 times per the day. The eruption of the Otman Bozdag volcano lasted over nine minutes. As a result of the volcanic eruption, the flame rose to the height of 350 meters. Mud waste of 100,000 cubic meters covers an area of about 10-12 hectare. Saying that the volcano last erupted in 2004, the scientist emphasized need to conduct a monitoring in order to observe the process in volcanoes. Mud volcanoes are a fairly widespread geological phenomenon and over a thousand mud volcanoes are known to exist in the world. Azerbaijan holds the first place in the world for the amount of mud volcanoes – some 60 percent of mud volcanoes are active here. Azerbaijan's mud volcanoes definitely should be part of any tourist's itinerary. Most are located on Absheron, around Baku. There are 100 near the Gobustan Reserve alone. There are another 200 on the islands of the Baku archipelago and in Shamakhi and Shirvan regions, two hours’ drive from Baku.